Chrome-plated, solid brass faucet with ABS tip lets you select filtered drinking water or ordinary water for cleaning. Designed for use with water filtration. Use with any under sink filter. Long reach stainless steel spout. Meets new low lead standards. Requires a 7/16" cutout to install. 1/4" input compression with adapter for 3/8". Replaced original sink faucet in 2000 Bounder 32' motorhome, which had been leaking. Went in easy, no leaks, good flow rate. Product was what I needed for my RV with the old one leaking. Shipping was fast and price was fair. The first faucet I received was defective. A call and some exchange of email photos showed the faucet I recieved was made in China and was not like the one Dyers tech had which was made in the USA. 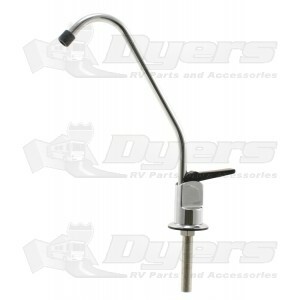 Dyers promptly issued a return shipping lable and sent the US made faucet by priority mail. I was very pleased with the follow-up by Dyers!